We are only 2 weeks into the new year. It is a great time to find resources to help you on your journey to eating healthier. 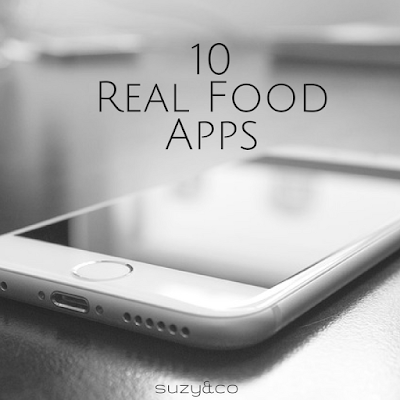 Here is a list of 10 apps that can help you on your path to real food. 1. Dirty Dozen - I use this every time I go grocery shopping. It gives you a list of the most and least pesticide laden fruits and veggies. 2. Fooducate - Gives you nutritional values of the foods you eat including controversial ingredients. 3. Seafood Watch - Helps you choose the best choice of fish, a good alternatice, or fish to avoid along with other recommendations. 4. Harvest - Teaches you how to pick the best produce. 5. Non-GMO Project Shopping Guide - Gives you a list of products and brands enrolled in the Non-GMO project so that you can support companies that do not use GMO foods. 6. Seasons - Helps you eat more seasonally by giving you information about what crops are currently in season both locally and non-local. 7. Whats on my food - Similar to the dirty doze, this app not only tells you about pesticides but tells you which ones usesd and which are the most dangerous. 8. Locavore - Shows you farms, farmers markets, and CSA's near you. 9. How to Cook Everything - This app has 2000 recipes on it from Mark Bittman. 10. myshopi - Although this is just a shopping list app, it is my favorite and it is free. I have tried a lot of grocery list apps and erased almost all of them. This is simple and easy to use. It has pictures of items, or you can add pictures and it saves frequently bought items. Note: These were the costs at time of posting. Prices and availability may change.